Rob • McClallen & Associates, P.C. Rob McClallen is a Rutland Vermont native who graduated from Middlebury College, and Albany Law School, Union University. Rob has practiced in Rutland since 1976. He is admitted to all Vermont state courts and the United States District Court for the District of Vermont. Rob’s practice encompasses personal injury, civil litigation, residential and commercial real estate transactions, contract law, wills and estates, family law, corporate transactions and formation, mediations and arbitrations. 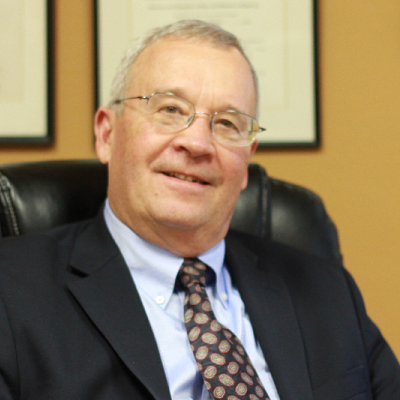 Rob has served as the President of the Vermont Trial Lawyers Association (now Vermont Association for Justice), and has been appointed as an acting judge in the Superior Court of Vermont Family Division, Criminal Division, and Civil Division. Rob represents individuals and corporate clients in a variety of transactions. He is active as a presenter at legal seminars, and volunteers as a guardian ad litem and attorney for children and adults with developmental disabilities in Family Court and Probate Court proceedings. This website has been designed by McClallen & Associates, PC to provide general information only. Accessing or contacting us through this website does not create an attorney-client relationship. Please do not send confidential information until an attorney-client relationship has been established.